There were no changes in the standings after a peaceful day in Saint Louis. For the first time in the tournament, all the games ended in draws but it wasn’t for the lack of trying. Both Magnus Carlsen and Hikaru Nakamura had excellent chances to score a full point but vigilant defense was the theme of the day. At the end of the day, five players still remain tied for first place as the first half of the tournament is in the books. Tomorrow is a day off, an important point that can make or break the tournament. After the rest day, the players are expected to return rejuvenated and ready for long battles, as the fight for first place continues. 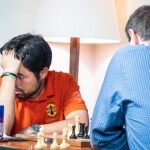 Shakhriyar Mamedyarov essayed the Tarrasch Defense, an unusual choice that has been tried by his countryman and second Rauf Mamedov several times. Nakamura played a novelty on move 11, veering the game toward unknown territory. After few inaccuracies, Mamedyarov found himself in an unpleasant position even though he felt optimistic about it. Two moves before reaching the first time control, the American threw away his advantage due to a tactical miscalculation. Both players looked disappointed and disgusted with the turn of events. 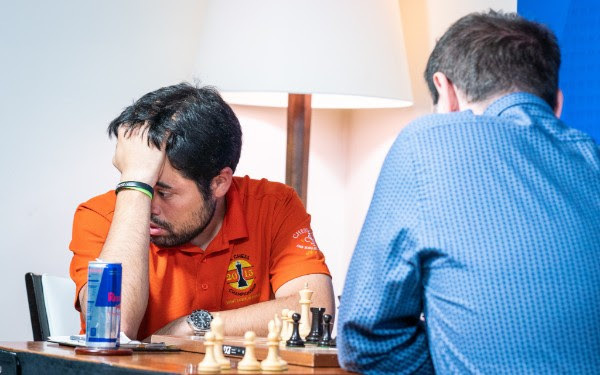 While it is understandable why Nakamura was unhappy about his blunder, Mamedyarov explained that he wanted to continue the game and was disappointed by Nakamura’s choice of liquidating and thus forcing a draw. “Today is one of those days where you have to say well done, good defense” – Magnus Carlsen in his postgame interview. The World Champion did not play the most challenging line against the Tarrasch Defense, but Wesley So still had some problems he needed to solve. Carlsen missed an opportunity pointed out by Russian commentator Peter Svidler which would have allowed him to win a pawn. The variation he chose miraculously worked tactically for the American who allowed his opponent’s pawn to reach all the way to the 7th rank. So played the most precise moves for a long period of time in order to force a perpetual and escape unscathed. 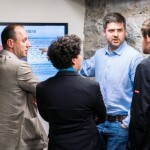 The all Russian matchup was a theoretical discussion in a topical line of the Berlin Defense. 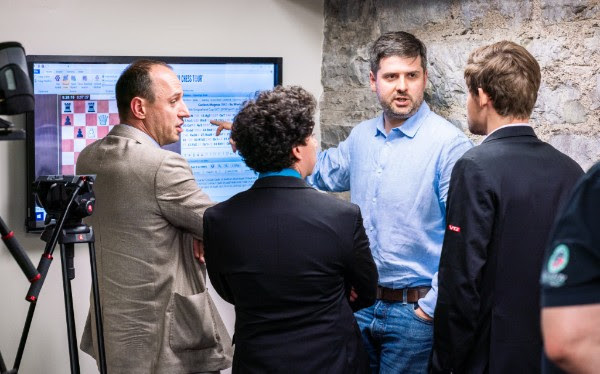 The game was reminiscent of the one between Vachier-Lagrave and So from two days ago as Karjakin executed a similar idea to the Frenchman’s by exchanging his e pawn with the c7 pawn. The pawn exchange was the beginning of the liquidation of the position that lead into a drawn bishop endgame. It appeared that both players were satisfied with the result of the game as Karjakin is still recovering from his first two losses, while Grischuk remains on top of the cross table. At first glance, this game might have looked like a typical quiet game in the Petroff Defense, but there was more than met the eye! Caruana stayed loyal to his pet line, which served him well before. Vachier-Lagrave was quite pleased with the outcome of the opening, sharing in the confessional booth that he did not see counter play for his opponent but felt sure that Caruana would find it regardless. Caruana was under pressure with the black pieces but did not think it was anything catastrophic. In the postgame interview, he shared all the sharp lines that needed to be calculated in order for him to earn the half a point. The uneventful game ended in the first hour. Levon Aronian chose his favorite variation in the Queen’s Gambit but was not able to gain any advantage with the white pieces. Anand proved once again that he is one of the best prepared players by playing a novelty that immediately equalized the position by forcing white to exchange the pieces. A draw was agreed in an opposite color bishop ending with each side having three pawns.